Two weeks from the event's begining the Anhembi Sambadrome in the north region of São Paulo city goes through reforms to receive more than 30 thousand people. This year, there were changes in the places where are the tables and chairs of the track and the retreat of the battery, to provide better viewing for the audience. Despite the rain, the workers still doing their best to make it happen. The track will receive a new painting three days before a show. The color chosen will have a darker gray than the last year, to avoid reflections. The painting of the bleachers, which will once again be white, has already begun. For the Carnival 2010, the Sao Paulo Turismo (SPTuris) says that the goal is to improve the visibility for those who are watching the parade. A platform will be activated to ensure the best viewing of the percussionists that will be playing at the back - the musicians who are behind will be higher than the runway. For those who watch the parades in the stands, nine screens will show all the details of the schools that are presented. There will have 14 Samba groups in the two days of the Special Group. The coordinator of the carnival SPTuris, Marco Antonio Santana, believes the event has been improving every year. "Certainly, it will be better than last year. We're working on it" according to him. The area of concentration has a new floor, already prepared to the Indy Race that will pass through the Sambadrome next March. Accompanied by the Brazilian drivers of the Formule Indy, the City Mayor Kassab went to visit the Sambodromo, where the race track will be set after the Carnival. During his visit, few minutes after that he said the rain wouldn't be a trouble to the Indy Racing League the place became flooded because a strong rain. The route, which passes through sambadrome, Marginal Tiete and Olavo Fontoura Avenue, has been punished by the rains. The chaos returned to that region yesterday. The Tiete River overflowed and flooded part of the track of the Marginal. 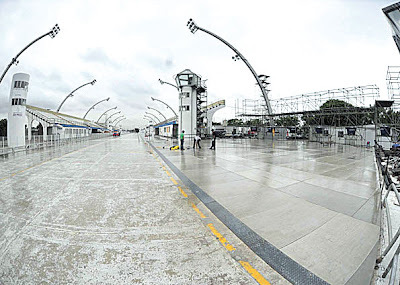 The Olavo Fontoura, which will be one of the lines of the circuit, also flooded, leaving cars, buses and pedestrians stranded for hours during the late afternoon. 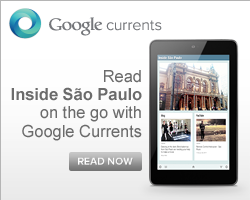 The race in Sao Paulo is scheduled for March 14, during which the rains are still intense.